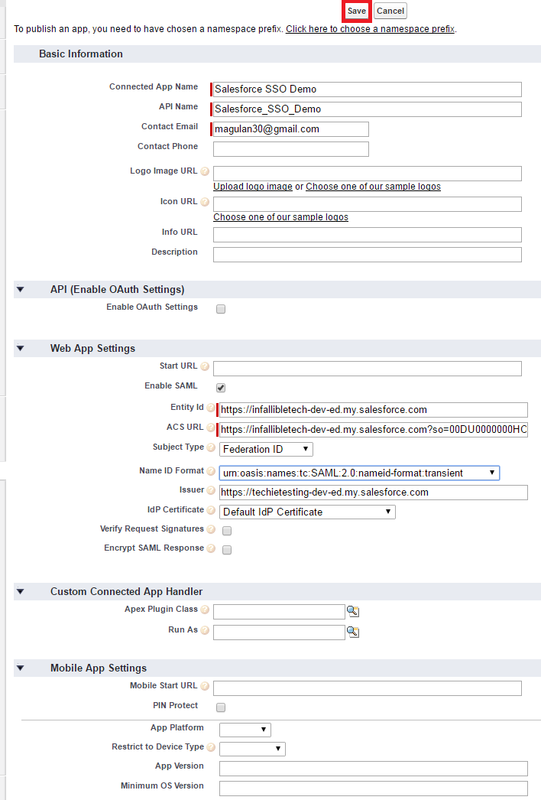 Partner accounts are Salesforce accounts that a channel manager uses to manage partner organizations, partner users, and activities when using the partner portal. 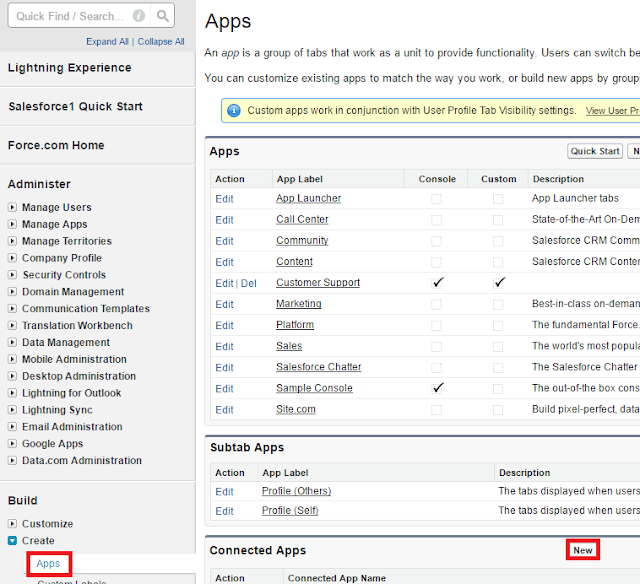 Each company with which you partner should be added to Salesforce as a business account. Channel managers are associated with partner accounts by account ownership. 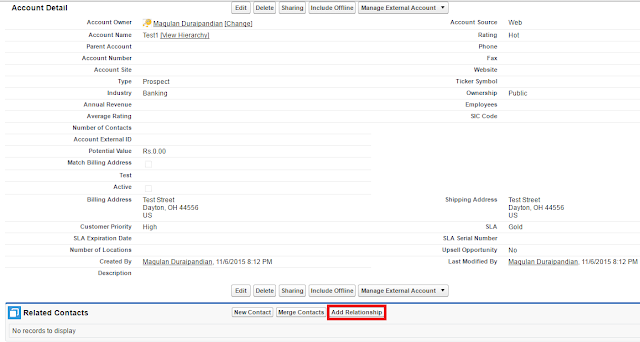 A channel manager who owns a partner account can access all the information and manage all the activities of the partner account, including that of any partner user associated with the partner account. This allows the channel manager to easily keep up-to-date on partner activities. 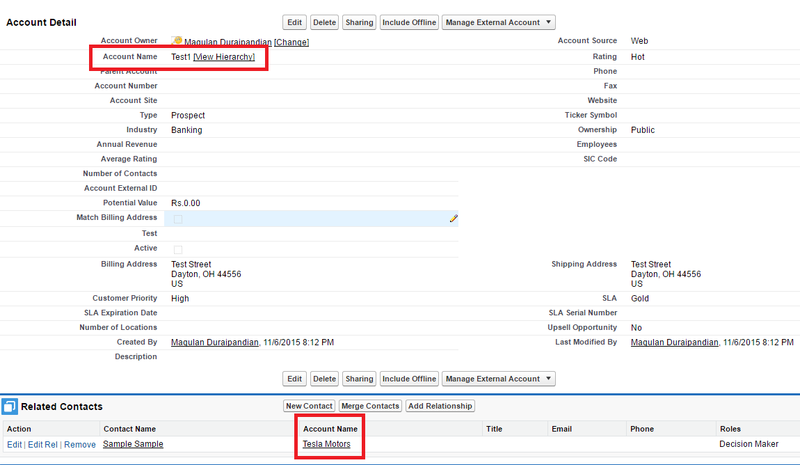 Once an Account is enabled as a partner, it appears in reports and list views that are filtered on the isPartner field. 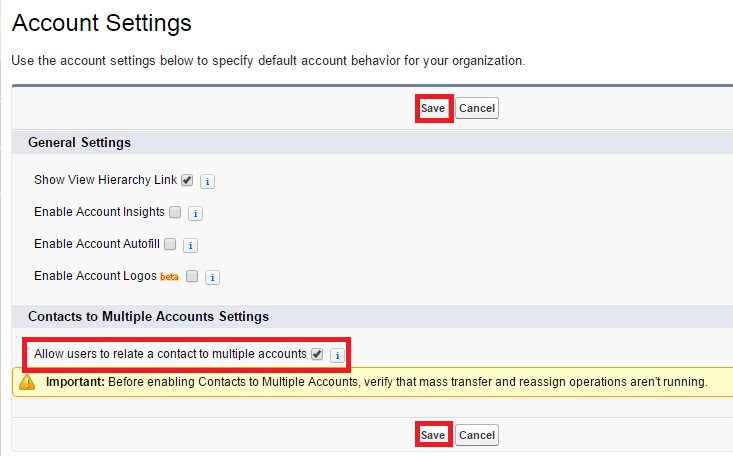 Additionally, partner users can be created from contacts associated with this Account. 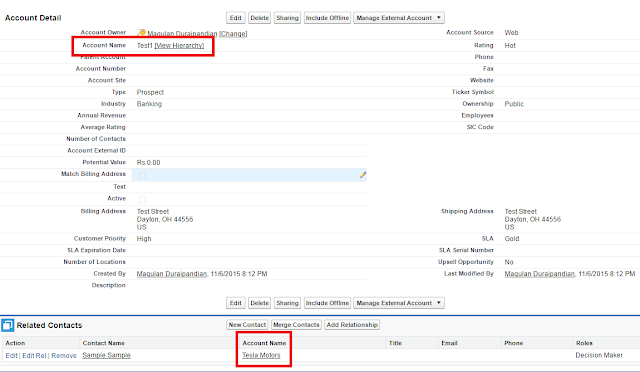 Selecting a partner on an account or opportunity automatically creates a reverse partner relationship so that both accounts list the other as a partner. The role you select is applied to the partner account; in the current account, the reverse role is applied. Removing a partner from an opportunity or account removes the partner's relationship with the opportunity or account, but does not delete the partner account. If you change the account for an opportunity that has partners, all partners are deleted from the Partners related list. Partner accounts can’t be deleted, but can be disabled. Disabling an account with external users permanently dsables all external users associated with the account and removes them from all communities, groups, teams, permission sets and sharing rules with which they are associated. 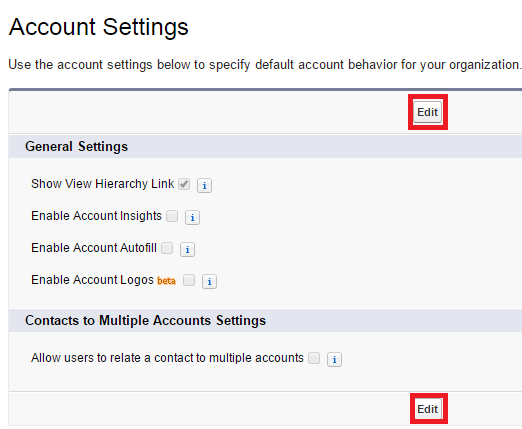 Also, roles and groups associated with the account are permanently delted and not moved to the Recycle Bin. 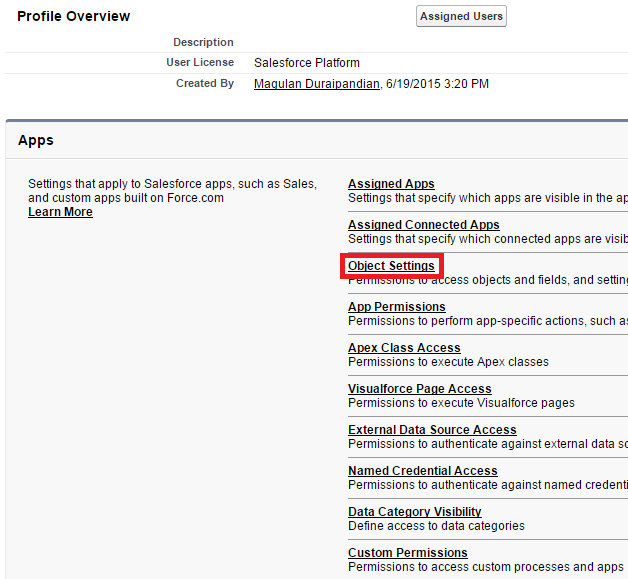 How to enable SSO SAML using Salesforce as Identity Provider? 1. Setup domain for the Organizations. 2. Provide Namespace Prefix for the Organizations. 3. In Identity Provider Organization, go to Security Controls --> Identity Provider. 4. Click "Download Certificate" to download the certificate. 5. 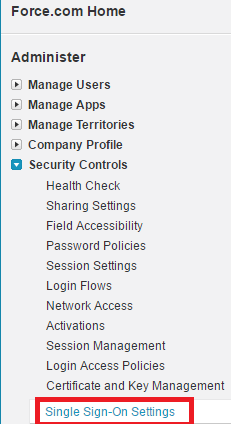 In Service Provider, go to Security Controls -- > Single Sign-On Settings. 9. Enter the details as below. 10. 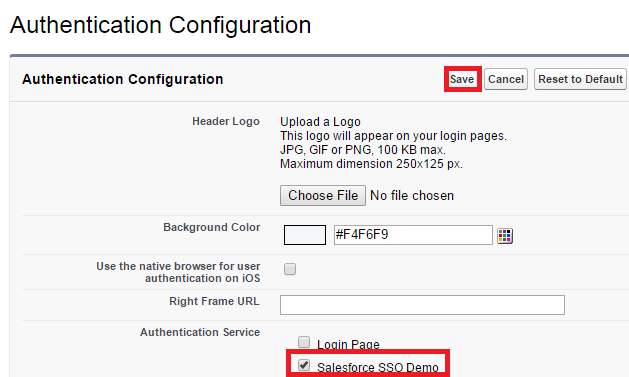 Copy the Salesforce Login URL. 11. In Identity Provider, go to Create -- > Apps. Click "New" under Connected Apps related list. 12. Enter the details as below. 13. 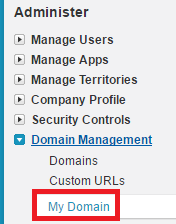 In Service Provider, go to Domain Management --> My Domain. 14. 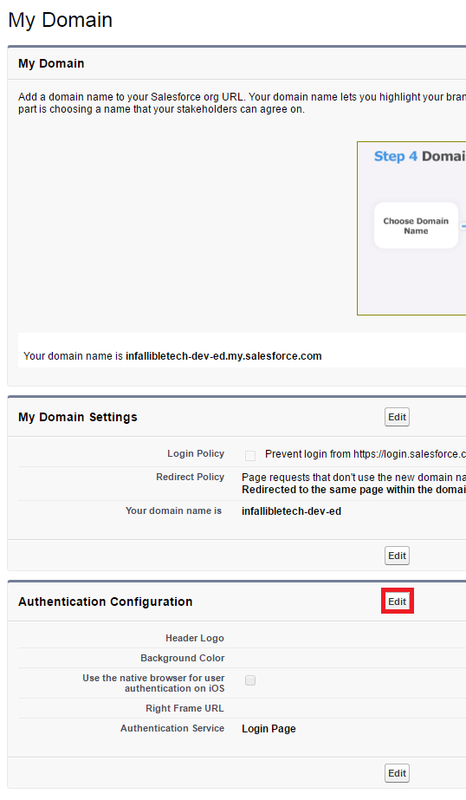 Click "Edit" button under Authentication Configuration. 15. Enable the SAML Single Sign-On Settings. 16. In both the organizations, go to users and select one user and set the Federation Id as unique in both. 17. 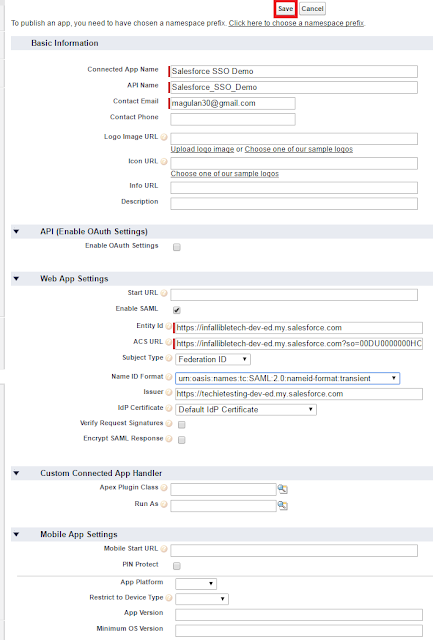 Make sure in the Identity Provider Organization, the user has access to the Connected App. 18. Login in to Identity Provider organization. 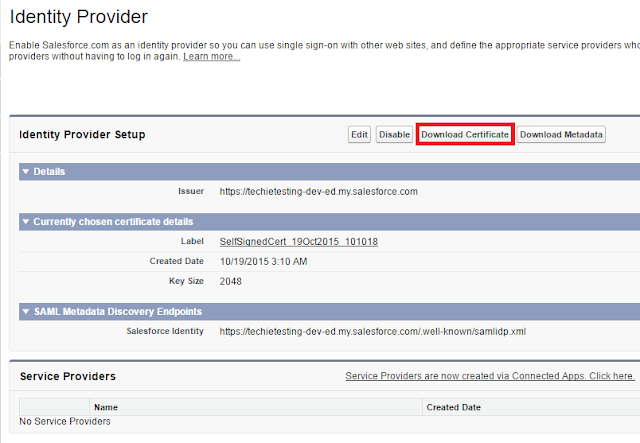 In another tab, use the Service Provider organization URL, you will be able to login without entering credentials. If you face "We can't log you in. 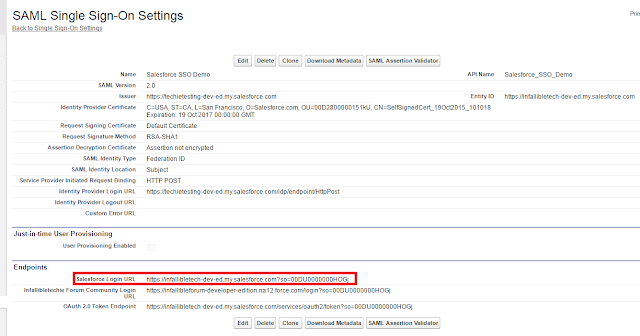 Check for an invalid assertion in the SAML Assertion Validator (available in Single Sign-On Settings) or check the login history for failed logins." issue, make sure in the Identity Provider Organization, the user has access to the Connected App. 1. This field cannot be used in Search. 2. 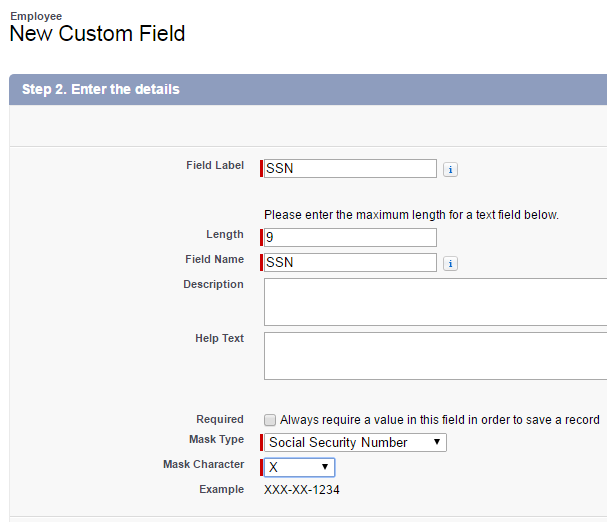 This field cannot be used in SQOL "WHERE" and "ORDER" clauses. How to fire validation rule only in update operation in Salesforce? 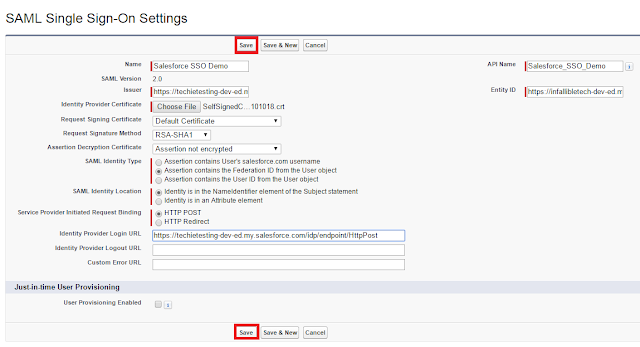 Use NOT(ISNEW()) to fire validation rule only in update operation in Salesforce. 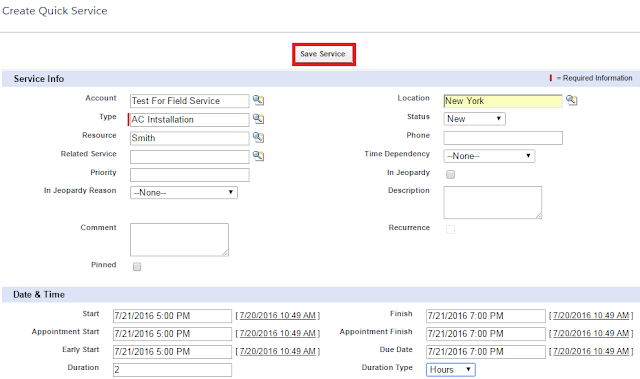 Follow the below steps after installing the Field Service Lighting Managed Packages. 1. 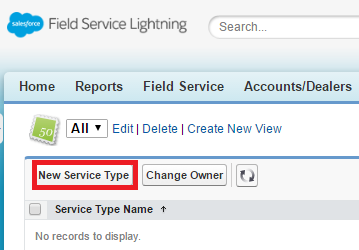 Go to Service Types tab and click "New Service Type" button. 2. 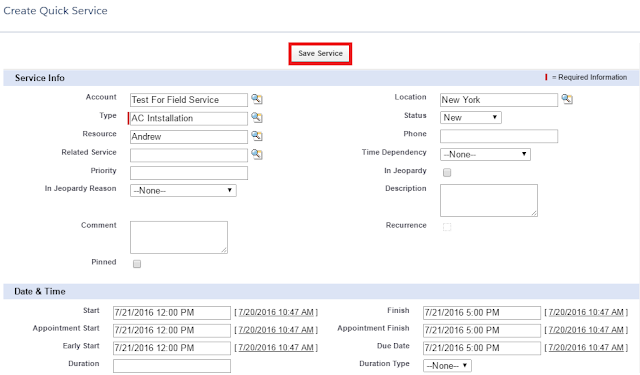 Create a new Service Type. 3. Go to Locations tab and click "New Location" button. 4. Create a new Location. 5. Go to Resources tab and click "New Resource" button. 6. Create 2 or more Resources. 7. 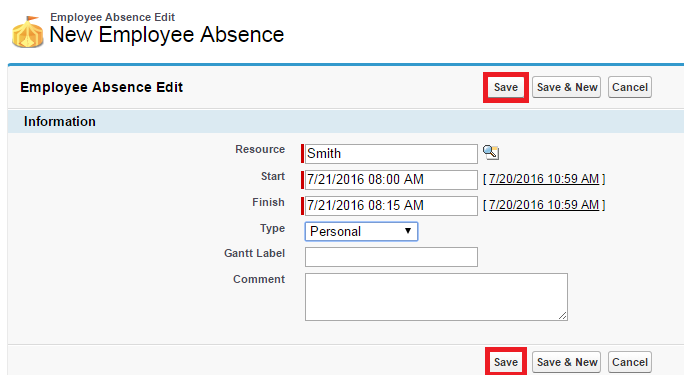 Go to Employee Absences tab and click "New Employee Absence" button. 9. 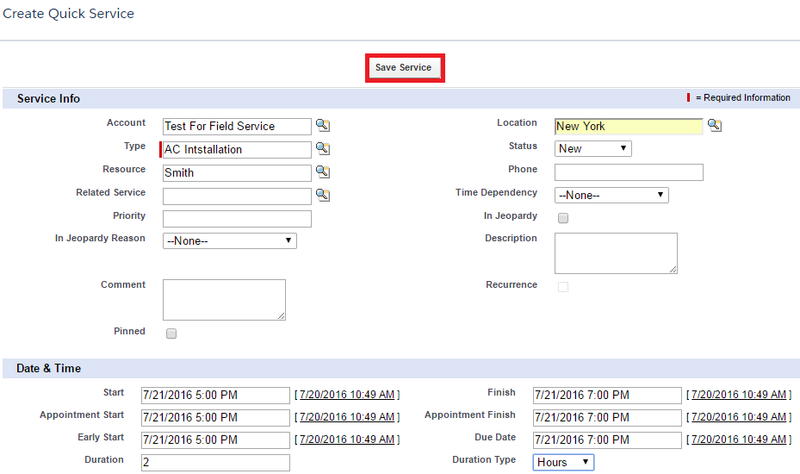 Go to Field Service tab. 10. Save the Location Filtering. 11. 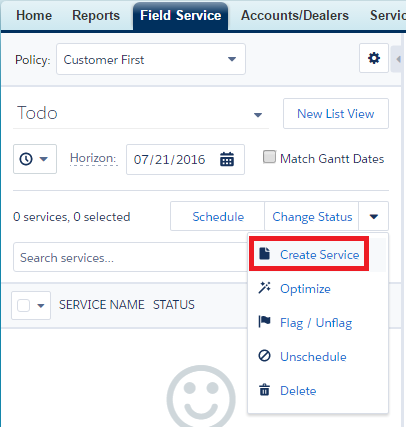 Select Create Service option. 12. 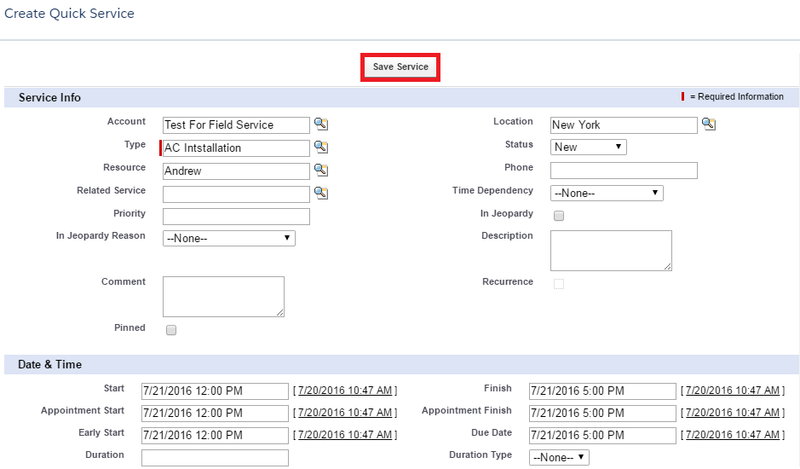 Create 2 or more Service records. 13. You can see the records in the GANTT Chart. Shield Platform Encryption gives your data a whole new layer of security while preserving critical platform functionality. It enables you to encrypt sensitive data at rest, and not just when transmitted over a network, so your company can confidently comply with privacy policies, regulatory requirements, and contractual obligations for handling private data. Classic encryption lets you protect a special type of custom text field, which you create for that purpose. With Shield Platform Encryption you can encrypt a variety of widely-used standard fields, long with some custom fields and many kinds of files. Shield Platform Encryption also supports person accounts, cases, search, approval processes, and other key Salesforce features. Manage Encryption Keys - Permission to manage Shield Platform Encryption. View Encrypted Data - Permission to view the encrypted fields. 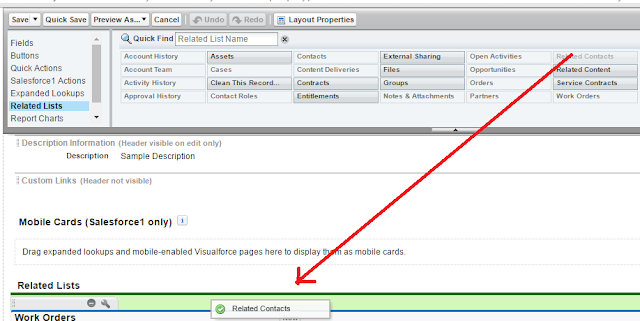 To fix "ReferenceError:key is not defined" Salesforce Lightning issue, declare the variable inside the for loop. Check the below example. We get Permission Import Personal Contacts depends on permission(s): Create Account, Create Contact, Edit Account, Edit Contact, when try to move Account or Contact object permission. To avoid this issue, we have to give Create and Edit access for Account and Contact. After the deployment we can remove it directly by going to that profile. 1. Remove implements attribute from the component. 2. Remove the usage of the component. When you face System.QueryException: unexpected token: 's' issue, use String.escapeSingleQuotes() method to avoid that. If you face Failed to save undefined: descriptor is null, please set type attribute. 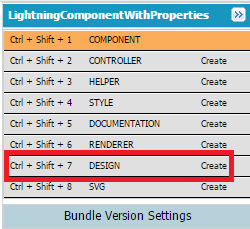 How to set properties in Custom Lightning Component in Salesforce? If you face Failed to save undefined: The attribute "aria-hidden" was not found on the COMPONENT markup://c:svg, go to the svg or svgicon component and check the attribute name. Sometimes it will be ariahidden instead of aria-hidden. If you face Failed to save undefined: No COMPONENT named markup://use found : [markup://c:AppAssignmentComponent], use <span> instead of <use>. Make sure you have created the svg or svgicon lighting component. If you face No COMPONENT named markup://svg found : [markup://c:AppAssignmentComponent] issue instead of using <svg> try <c:svg>. Make sure you have created the svg lighting component.